It’s an early autumn type of day here in Virginia. We’ve been lucky to have several days like this in a row. 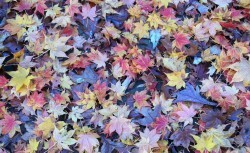 Cooler days and cooler nights usually bring on the color changes in the leaves on the trees. And I will pull out my favorite list of hearty soups. 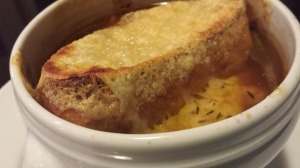 My Baked Onion Thyme Soup is one of my all time favorites. I’d mentioned in my recent Eating Healthier posting that eating soup can help you lose weight. Soup fills you up and goes great with a salad or half sandwich. Check out my other favorite soups in my recipes file. 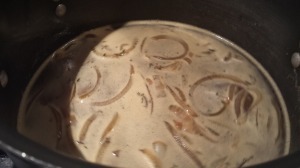 I have enjoyed some very favorite tasty onion soups at Petit Pois Restaurant in Charlottesville, Virginia, Bistro Vivant in McLean, Virginia, and even Morton’s the Steakhouse in Reston, Virginia. 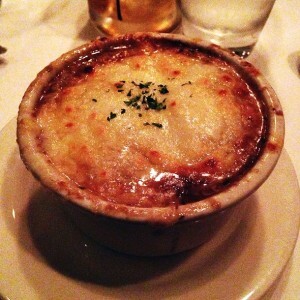 The Morton’s Five Onion Soup is very rich, thick, and potent. 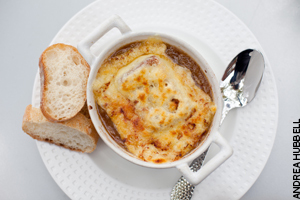 French bistros Petit Pois‘ and Bistro Vivant’s onion soups are lighter and more elegant. I like both styles. When I was in college, during my last semester before graduation, I remember a professor readying us for interviews for jobs in the real world. 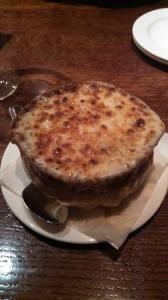 He said that the worst dish that a candidate could order during a job interview meal is onion soup! 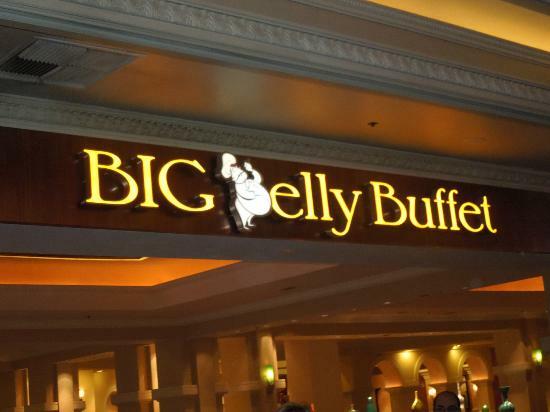 It’s all the gooey cheese and stringy onions, and it’s drippy. Eating onion soup could make for a messy interview. And of course, on my first job interview, the hiring manager took me to lunch at Joe Theismann’s Restaurant at the (now closed) Falls Church, Virginia location and suggested the baked onion soup! 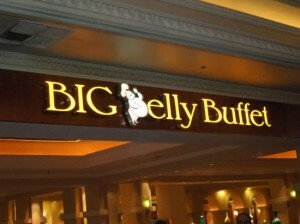 Luckily, I declined in favor of another dish. Interesting, and a sidebar to this article, I did end up meeting Joe Theismann himself on an evening flight to Pittsburgh from Washington, DC in the late 1990s. He was working for ESPN at the time having retired from Washington’s Super Bowl winning football team. Back before 9/11, it was a bit simpler to fly. I thought I recognized him while sitting in the waiting area at the gate. Soon, we boarded the flight. He was sitting in my same row, but across the aisle by the window. After we ascended to cruising altitude, I motioned to the young flight attendant and asked her who is the passenger sitting over there. She said, “Joe Theismann?” but she incorrectly pronounced his name as “thees-man.” I asked if she knew who he was. She shook her head and said no. I told her he was a Super Bowl winning quarterback for the Washington Redskins! She and the other young flight attendants took turns walking by and looking at Mr. Theismann. It was comical. 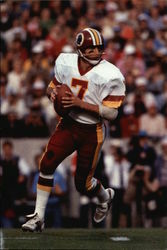 When the flight landed, and his seat mate had moved out into the aisle ahead of us, I reached out my hand, and said, “Wonderful to meet you, Mr. Theismann!” He smiled and shook my hand. He had a heck of a strong handshake. As we departed from the plane, I told him about this same onion soup story and he laughed. We made small talk until someone met him at the seating area, and we parted ways. I did frequent his restaurant pretty often in Falls Church, VA with coworkers after I got my first job! Now where were we? 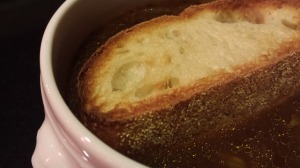 Oh yes, onion soup! This soup is simple to make. And what’s better than a slowly simmering soup on a chilly day? Your house will smell magnificent. One of the most important ingredients in a soup is the broth or stock that is used as the base. 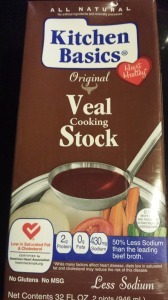 You can use beef, chicken, veal, or vegetable broth/stock in this soup. The next important ingredient for onion soup: Onions! Use a combination of your favorite onions. The star herb in this onion thyme soup is thyme. You can use either dried thyme of a few sprigs of fresh thyme. 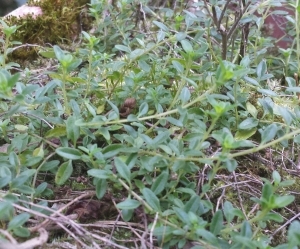 Just remember to remove the sprigs of thyme from the soup before serving! 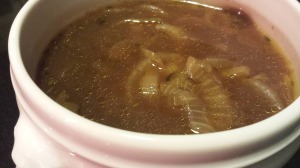 To make this onion thyme soup, start out with some thinly sliced onions. 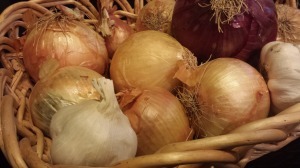 You can use red, white or yellow onions, sweet onions, shallots, or a combination of whatever you have on hand. 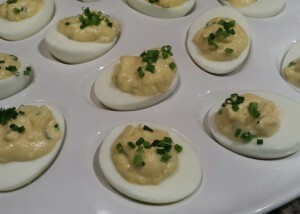 I used a yellow onion and a sweet onion for this recipe. You can chop the onions if you plan to puree the soup. 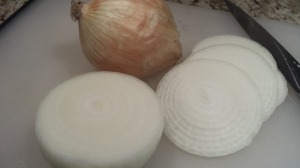 You can use thicker sliced onions and then halve the rings. Melt some butter in some olive oil in a soup pot. Add the onions. 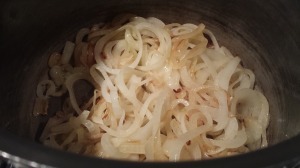 Over low heat, sweat the onions until they are soft and slightly browned. Add some flour and mix it around. Sprinkle in some dried or fresh thyme leaves. Pour in some chicken, veal, beef, or vegetable broth/stock. 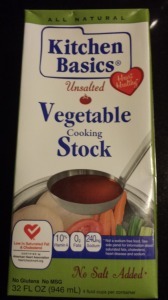 I like to use either veal or vegetable broth/stock. Sometimes, I make my own beef stock when I have leftover beef bones. You can also add some white or red wine for a rich flavor. Stir and let the soup simmer over low heat for about an hour. When the soup is ready, you could pour the soup into a large container and refrigerate overnight so the flavors can become more intense. Or if ready to eat, ladle the soup into oven-proof bowls. Toast a few slices of baguette to make large croutons. 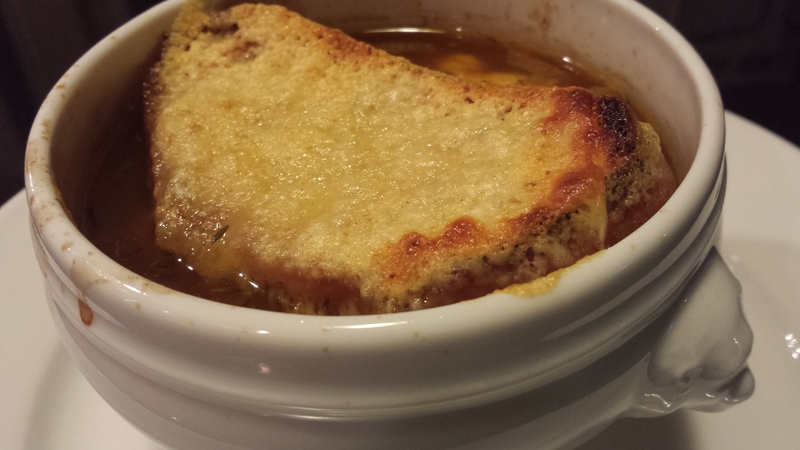 Float a toasted crouton on top of the soup in each bowl. Top each crouton with a slice of Swiss cheese. Bake in a 350 degree Fahrenheit oven for 15 minutes or until the cheese is melted and bubbly. You may wish to turn on the broiler for a few minutes to brown the cheese slightly. Remove the bowls from the oven. Let cool for a few minutes, and serve! 1. Toast the baguette slices under your oven broiler to make toasted croutons. Set aside. 2. After toasting the croutons, set your oven to 350 degrees Fahrenheit. 3. 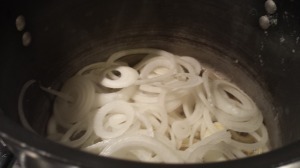 Thinly slice the onions and separate the onion slices into rings. 4. Warm some olive oil in a soup pot over medium low heat. Melt the butter in the olive oil. 5. Add the onion rings and sweat them until they are soft and slightly caramelized. 6. Add the flour to the onions and stir. Let cook for a minute. 7. Add the broth/stock, thyme and optional wine and sugar. 8. Simmer the soup, uncovered, for an hour over low heat, stirring occasionally. Season to taste with salt and pepper. 9. 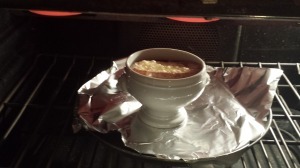 When the soup is ready, ladle into it ovenproof bowls. 10. Float a toasted crouton on each bowl of soup. 11. Top each crouton with a slice of Swiss cheese. 12. 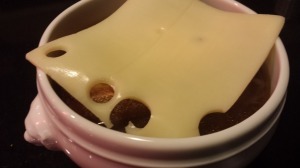 Bake the soup in the oven proof bowls for 15 minutes or until the cheese is bubbly. 13. If the cheese hasn’t browned, place under the broiler for a few minutes. 14. Remove the soup bowls from the oven, let cool a bit, and serve! Serves 4 as a main course or 8 as a soup course. 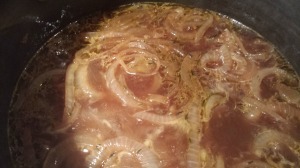 Variations: Select a combination of onions for use in this soup. You can add fresh or roasted garlic cloves for a different flavor. Use whichever broth/stock is your favorite. Beef broth will make the soup richer than chicken or vegetable stock. Omit the toasted crouton and the Swiss cheese if you are watching your caloric and fat intake. You can omit the wine. This soup is better when the flavors get a chance to intensify in the refrigerator overnight. If you want to serve the soup plain, just ladle in to the bowls and don’t top with the crouton and the cheese. It’s aromatic and satisfying by itself!